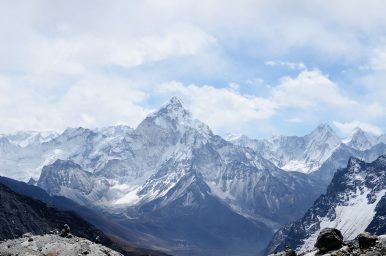 The Himalayas are a global center for linguistic diversity. But that diversity is at risk. The Himalayas, the world’s tallest mountains, are a meeting point for Earth’s two most populous nations — India and China. These superstates face off across hundreds of kilometers of disputed Himalayan borders. They also interact with, and through, the Himalayan buffer states of Nepal and Bhutan. Both India and China are currently growing more jingoistic at home and assertive abroad, creating an increasingly significant geopolitical faultline. However, a sole focus on the these two superstates misses important aspects of regional geopolitics. A look at the Himalayan language politics reveals both hidden actors and invisible victims in regional struggles. The Himalayas are a global center for linguistic diversity. Setting out from Beijing or Delhi, the number of languages rises with altitude, conforming to global patterns that see linguistic diversity increasing in rough, mountainous terrain. This diversity is not neatly patterned: state, ethnicity, and language are not correlated. Knowing where someone lives or what identity they profess does not tell us what languages they speak. Take Bhutan, for example. Though slightly smaller than Switzerland, and home to fewer than 1 million people, 21 indigenous languages are spoken in Bhutan. The country’s official language, Dzongkha, is enshrined in the national constitution and mandated in political forums. But it is not Bhutan’s most widely-spoken language. That honor goes to Tshangla, which is spoken by over a third of all Bhutanese. It is also spoken in India and China, demonstrating how Himalayan borders often disregard languages (and vice versa). English plays a significant role in Bhutan, with the linguist George van Driem describing Bhutan as Asia’s “most English speaking country.” This is indicative of the country’s aspiration not only to participate in the global community of nations, but also to disembed itself from regional politics; English was selected as a replacement for Hindi, which served as the medium of education until 1964. At the same time that Bhutan was distancing itself from India and Hindi, it was differentiating its national language, Dzongkha, from Tibetan. Although Dzongkha is written in the Tibetan script, the spelling was reformed in the 1970s.Written Tibetan, like written English, reflects the historical state of the language more than present pronunciation. The reform brought the script closer to spoken Dzongkha, and efforts to bring written and spoken languages closer still continue today. This attempt to create distance from written Tibetan is an exception in a region where the language has deep historical roots and continuing transnational influence. In Himalayan Pakistan, a movement among the Muslim Balti people to write their language in Tibetan script has been part of wider efforts to carve out a distinct local identity. In India, activists have been campaigningto have Tibetan (in India called Bhoti) recognized in the national constitution as an official language. Meanwhile, written Tibetan is promoted in schools right along the Indian Himalayas. While this is often welcome, it has also created controversies and placed pressure on smaller languages. This growth is partly the result of Tibet’s religious influence and international prestige. Indian strategy has also possibly played a part, with New Delhi aiming to create a Buddhist buffer against China, and exert control over Kashmir. The transnational growth of Tibetan identity is not occurring in isolation from other factors. In Nepal, speakers of Syuba(a Tibetan language that is to Classical Tibetan what Spanish is to Latin, but with a speaker population of around 1,500 people) chose to use a modified version of Nepali’s Devanagari script. This allowed Syuba speakers to gain literacy in their own language by using their existing literacy in the national language. Limbuand Lepcha, both transnational languages spoken in Nepal and India, are more distantly related to Tibetan, and already have their own long-standing orthographic traditions influenced by the Tibetan script. When ethnic groups and languages spread across national borders, different frameworks for managing diversity become apparent. Nepal’s constitutionrecognizes all of its 123 languages as “national” languages, including languages like Sherpa, Yolmo, and Nubri (although Nepali is still the “official” language). Across the border in China, these would all be considered dialects of Tibetan. The same goes for Ladakhi and Sikkimese in India, and Dzongkha in Bhutan. In contrast to these countries, China is definitely a “lumper” rather than a “splitter.” Tibetans in China speak at least 16 different varieties of Tibetan, which in Nepal would be considered languages, but in China are “dialects.” Tibetans also speak at least another 26 non-Tibetan languages that are only distantly related to Tibetan. But these languages are also lumped together by the state as a single language. This is like grouping everything between Svalbard and Sicily as a single language because they once shared Latin as a common liturgical language. At the same time states impose different definitions and statuses on languages, transnational languages can transcend localized differences. For example, Nepali is spoken in Nepal, India, and Bhutan. Despite its different status in these three countries, Nepali is still demographically and politically dominant over many indigenous and minority languages in the Himalayas. In Sikkim, although many people are highly multilingual, Nepali is not only a dominant lingua franca, but is also replacing many small languages locally. Himalayan states can and do reach across borders. Recently, China has intensified efforts to exert influence and stake claims in disputed Arunachal Pradesh, despite a lack of de jure control of the region. For example, in April 2017, a series of “official place names” were announced by Chinese officials for six locations inside Arunachal. Though released in Chinese pinyin, all names were clearly Tibetan. China, claiming Tibet as part of its inalienable territory, used the presence of Tibetan place-names to legitimize their claims to disputed territory. China’s strategic intent was clear, given that the announcement coincided with the visit of the Karmapa Lama to the region. A very different case involves the Lhoba (Luoba) people in China, who speak a number of languages (including Bangni, Bokar, and Taraon). A concerted propaganda campaign via Facebook, YouTube, and a dedicated Google site aims to show how well Lhoba people are treated by the Chinese state. Not only are the Lhoba people’s flourishing economy and vibrant culture displayed, but handy historical lessons are also provided on the relationships between Tibet, China, and Arunachal Pradesh — all from a Chinese state perspective. Attempts to reach across borders and influence minoritized populations are countered by the promotion of national languages within Himalayan superstates. Recent efforts by the Modi government to promote Hindi in India, for example, have led to widespread claims of “Hindi imperialism.” This, in turn, has led Indian states to intensify promotion of regional languages, such as Bengali in West Bengal. In this case, Nepali-speakers in the West Bengal city of Darjeeling protested moves to impose Bengali medium education. Meanwhile, Nepali language protests have further alienated the local indigenous Lepcha population. In China, meanwhile, the state has been aggressively promoting the national standard language, Putonghua, with particular intensity since the language was formally nominated as the national tongue in 2000. The impact on linguistic diversity has been disastrous. Half of the country’s languages are endangered. Increasingly, linguistic grievances lead to protests. Tibetans have taken to the streets to protest the removal of Tibetan from schools. Many of the 153 self-immolators have focused on their lack of language rights in their testimonies. Meanwhile, the non-Tibetan languages spoken by Tibetans are even more threatened, due to the state’s refusal to acknowledge their existence. Although Himalayan superstates are marginalizing minority languages through the promotion of national tongues, states are not the sole linguistic oppressors in Himalayas. Languages like Tibetan and Nepali, through their local demographic dominance, official recognition, cultural prestige, and transnational support, also contribute to the marginalization of the Himalaya’s smaller languages. For these groups, the region is not simply a checkerboard of domineering states, but also a complex and constantly shifting fabric of local and transnational actors. And unfortunately for the speakers of the Himalayas’ indigenous and minority languages, the only shared feature of all these actors is a hostile indifference to small languages and a willingness to cynically exploit them for strategic interests. As tensions continue to rise across the Himalayas, the prospects for these languages to be sustained into the future appear to be sinking. Gerald Roche is an anthropologist and Senior Research Fellow at La Trobe University in the Department of Politics and Philosophy. He has previously worked at the University of Melbourne and Uppsala University, and lived on the Tibetan Plateau in China from 2005-2013. His research currently focuses on the politics of language in Tibet. Lauren Gawne is a linguist and David Myers Research Fellow in the Department of Languages and Linguistics at La Trobe University. Her research focuses on the Tibeto-Burman languages of Nepal. She has previously held positions at Nanyang University of Technology (Singapore) and SOAS (London). Is China meddling in Taiwan’s elections?